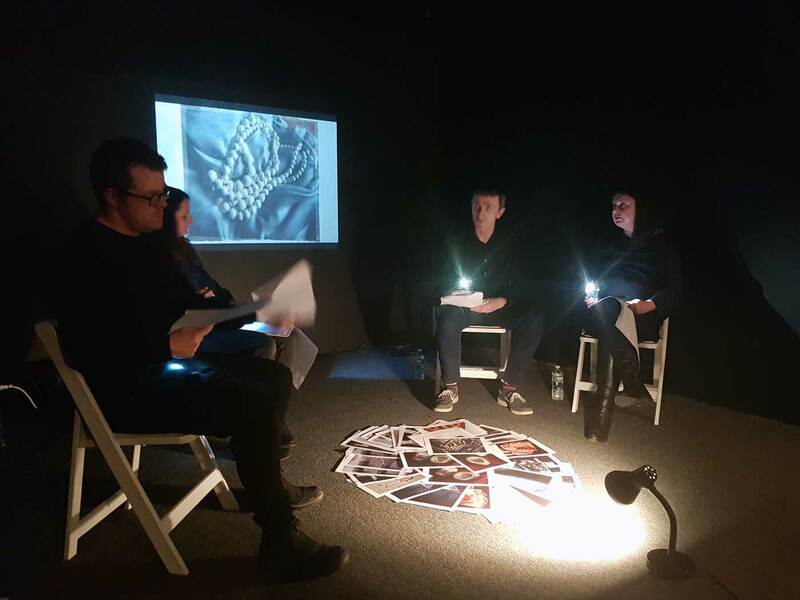 As part of our colleague, artist Jeanette Doyle’s, wonderful current exhibition ‘From A to Z & Back Again’ @ac.institute , in New York, the Aesthetics Group performed a new piece of work From A to Z and Back Again which was a response to Doyle’s work. The work continues the groups research which interrogates the aesthetics of language and politics in the digital age. By responding to Doyle’s set of treated digital prints, which referenced each letter of the alphabet, the performance offered a playful critique of the contested nature of words and their constituents. It attempts to play between the relation of the immaterial and the de-materialized nature of words and image, their analogue and digital registers. The Aesthetics Group presented a new paper titled: “A Post-Digital Aesthetics of the Inhuman Gaze: Reflections on I See Birds Flying Over the White House” at The Inhuman Gaze Conference at the Centre Culturel Irlandais, Paris. The conference was three-day multi-disciplinary international conference spanning the disciplines of philosophy, cognitive neuroscience, psychiatry, psychology, sociology and aesthetics. The conference theme, took as it’s point of departure, a quote from Merleau-Ponty where he posits the othering of the gaze and warns against the negation of empathy and affective responsiveness to the other through the gaze. The conference, through its multi-disciplinary format, provided an opportunity for the Aesthetics Group to reflect upon on our recent performance at the Research Pavilion in the context of 57th Venice Biennale (2017). 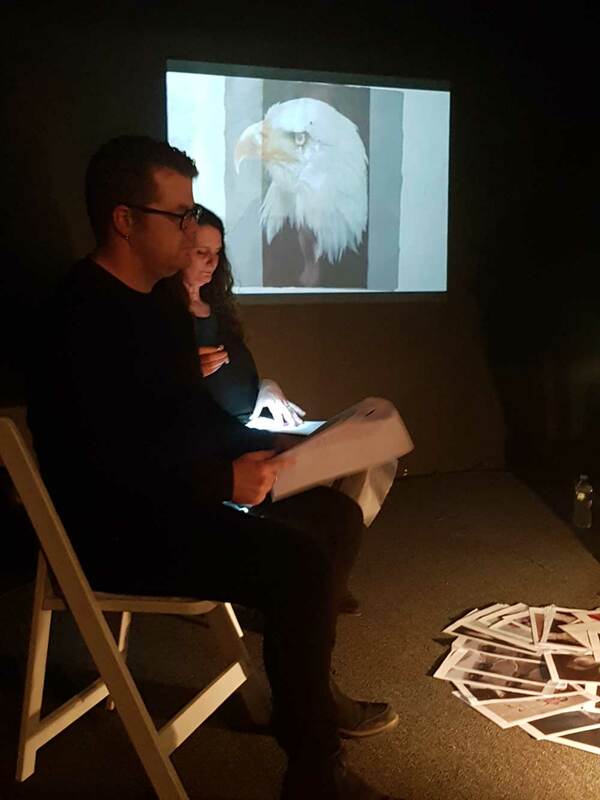 At the event The Aesthetics Group performed a research poem in response to New York based artist Michael Bell Smith’s Birds Over the White House (2006) . This artwork was especially repurposed for the occasion. The artwork is a digital algorithm of nodes representing birds flying over a schematic plan of the White House. 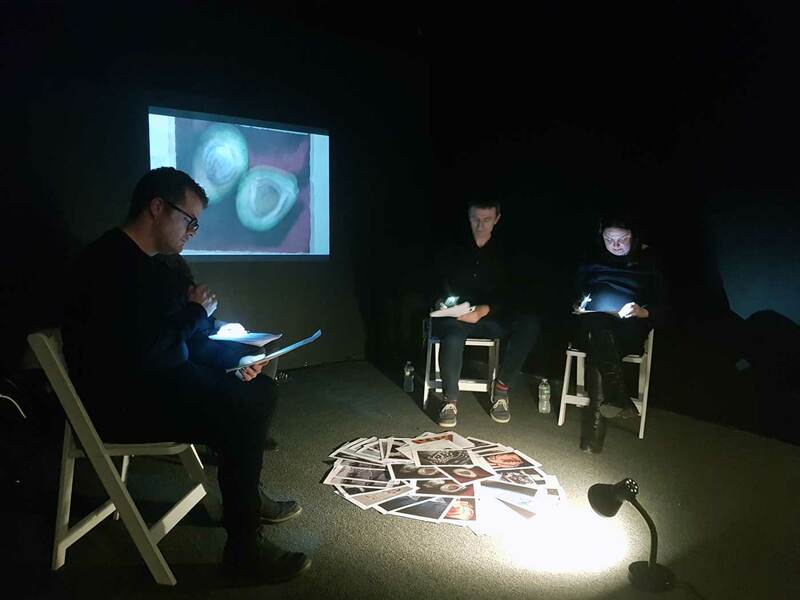 The artwork and its mediation through the performed research poem reflected the conference theme, asserting the potential breakdown of empathy through the technological gaze. 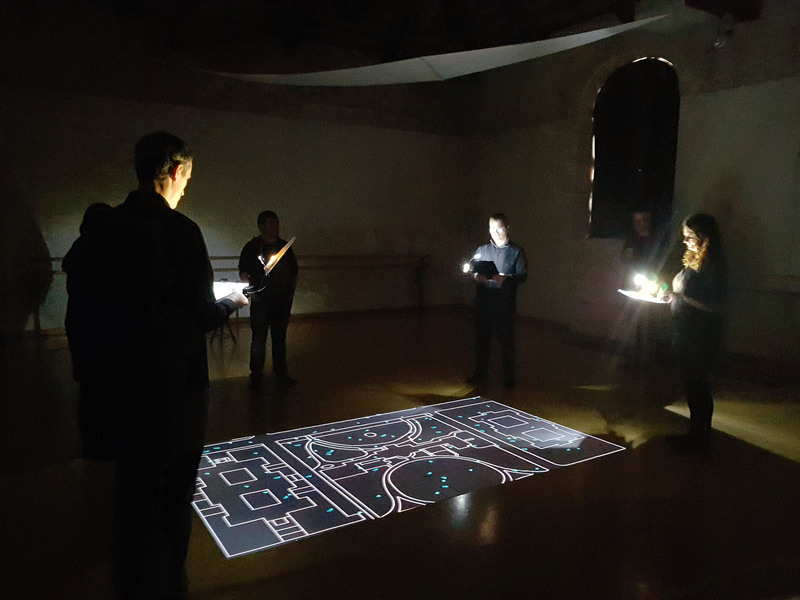 The presentation of the paper included a short video documentation of the performance in Venice which prefaced the presentation. The text, which was collaboratively written, was presented by three voices and was backgrounded by Bell Smith’s artwork. 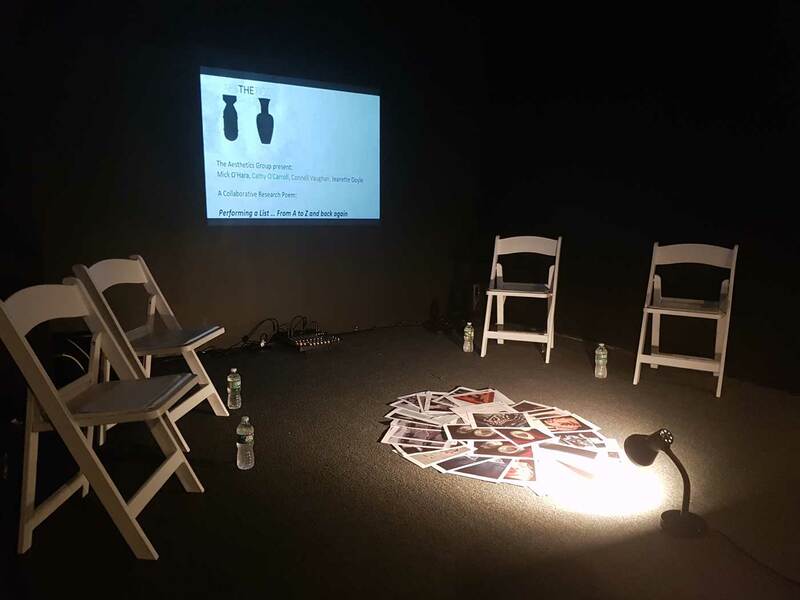 This opened a new mediated space for the audience at the conference, to experience the performance, the artwork and the text which reflexively operated across these different registers. Conference Presentation. Panel: (Chair) Clémence Saintemarie, Abeba Birhane, Venus Torabi, Dr. Luigi Corrias, Cathy O’Carroll, Jeanette Doyle, Mick O’Hara. Mick O’Hara presented “The Algorithmic Regime: Decoding the digital image” `at the The InHuman Gaze and Perceiving Otherwise Conference at the Centre Culturel Irlandais, in Paris on the 8th of June. The paper, sought the explore the claim that in the age of what has been termed the ‘post-digital’ our system of perception now lies enmeshed within the omnipresence of a technological or digital gaze. By mobilizing the writings and artwork of Hito Steyerl, the paper argues that through the digital image we become in a sense world-makers by the production and transmission of such digital images. It explored Steyerl’s claim that each of us are artists and as such we should reject the idea of the digital image as mere visual information. Instead we should invoke our roles as makers and interpreters of images and by doing so contest the politics of representation inherent within the digital base itself. (Panel: Chair- Christinia Landry, Rosi Braidotti, Richard S. Lewis, Jonas Oßwald. The Aesthetics Group present a new paper at the The InHuman Gaze and Perceiving Otherwise Conference at the Centre Culturel Irlandais on the 6th – 9th June. The paper is a reflection on our recent performance at the Research Pavilion in the context of 57th Venice Biennale (2017). The paper will be a reflection on our recent performance at the Research Pavilion in the context of 57th Venice Biennale (2017). At the event The Aesthetics Group performed a research poem in response to New York based artist Michael Bell Smith’s Birds Over the White House (2006) . This artwork was especially repurposed for the occasion. The artwork is a digital algorithm of nodes representing birds flying over a schematic plan of the White House. This paper marks the third iteration of an ongoing reflection on the aesthetics of the Inhuman Gaze. Previous incarnations of this research considered the distortion and manipulation of language use that predominantly defines the inhuman in opposition to the human. This was achieved through the adoption and assumption of the ‘birds eye view’through a poetic, thus humanizing, appropriation. This iteration reflects on the aesthetics of the inhuman gaze in terms of collective othering and the mediated state implicit in the shift from the digital to the post-digital where there is the assumption of the digital in quotidian reality. The advent of the post-digital requires a new reflection on the inhuman gaze. Historically Derrida argued that l’animot is distinct from the human and what is derogatively referred to as the ‘beast’. Whereas for Lyotard, we have to learn to be human as is it not our natural state and the inhuman encompasses the child, the animal and technology. For Stiegler, however, we must be ‘non-inhuman’ as he associates the inhuman with the maleficent aspect of technical development. Through a critique of the insect-like gaze of the digitized birds flying over the White House this paper argues that the banality of the post-digital renders a new form of collective othering that calls for a reconstruction of the aesthetics implicit in the non-human gaze. The Aesthetics Group would like to thank artist Michael Bell Smith and Foxy Production, New York. The Aesthetics Group recently performed “I See Birds Flying Over the White House” at the Research Pavilion at the Venice Biennale. The piece was developed in response to artist Michael Bell Smith’s wonderful artwork “Birds Over the White House” (courtesy of the artist and Foxy Production, NY) which the artist specially repurposed for the performance. The Aesthetics Group were also responding to the theme of the Pavilion “Utopia’s of Access”. Photos courtesy of John Beattie and Fiona O’Hara. 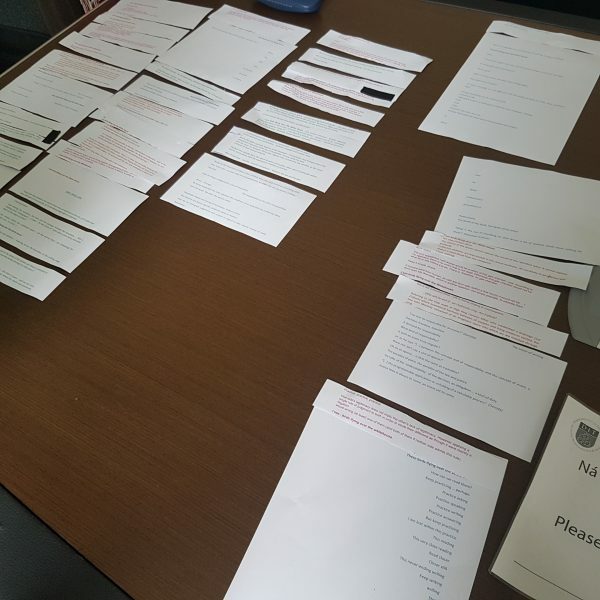 We are busy co-writing our script for our performance at the Research Pavilion in Venice for 30th-31st of September. Mick O’Hara and Connell Vaughan at the recent Beautiful Game workshop in North Carolina. Cathy O’Carroll presented–Mask-Track-Merge at the Research Pavilion, 28th-29th June 2017. This performance responded to both the Research pavilion’s central theme of ‘Utopia’s of access’ as well as that of the ‘Choreographic’. Mobilising the work of Gilbert Simondon along with verbatim testimony to reflect on the masking and unmasking of the skill of backstage labour. 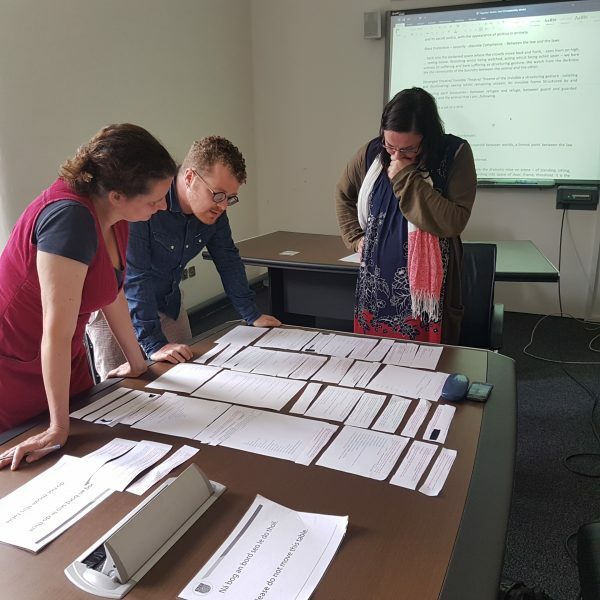 This was a two-day research event consisting of talks, discussions, workshops and performances / Valand Academy in collaboration with GradCAM, Dublin and the Department of Art, Goldsmiths. ‘Cf’ is an International project, initiated by artist Jeanette Doyle (Ireland) for GradCAM @ The Research Pavilion, Venice, September 29th – October 1st 2017. ‘Cf’ uses the Biennale as its template with particular attention to the staging of National Pavilions where artists and curators are invited to represent a nation of their own choosing in a manner of their own determination. Broadly speaking ‘Cf’ will manifest as a worldwide exhibition of contemporary art, which will unfold and reveal itself in streets, shops, homes, bedrooms, public spaces including galleries around the world. As well as the project’s physical presence(s), ‘Cf’ will be manifest in Venice as a series of projections, the temporal selection of which will be determined by an algorithm, representing videos and sounds files which capture international iterations of the project. Projects will be represented in the Pavilion prioritized by their conceptual remit and context. ‘Cf ’ will subtly subvert the well-worn Biennale model by allowing both selected and self-selecting artists/participants to nominate and represent their chosen country and to create work in response to that context on an incredibly intimate or epic scale. National pavilions may appear ‘out of context’ and in unexpected locations around the world. ‘Cf’ will create a flexible platform for representation embracing contingency and temporality. At its heart ‘Cf’ aims to explore complex questions surrounding issues of nationhood and national identity; the authority (or lack of authority) of the artist; and the capacity of the artist to assume ‘permission’. For instance ‘Cf’ will extend a network of invitations, however, it is also within the scope of the project for artists and curators to self nominate and stage projects where they claim the right to represent a nation of their choosing in a site they deem appropriate. Parallel to these broad conceptual concerns, ‘Cf’ also seeks to question emergent modes of production, presentation and dissemination of art as well questioning the forces, which allow the production of objects and ideas to find a home within the ‘artworld’. In order to submit your proposal as an individual or as a curator of a group selection for inclusion in the ‘Cf’ project as part of GradCAM @ the Research Pavilion in the context of the 57th Venice Biennale please complete the form, by doing so you should nominate which Nation state you would like to represent and where this representation (in which National State) will take place.